Cucumbers are “comin’ hot” now in Washington. I’m walking down the street and I see boxes outside people’s homes that say “FREE” and I look inside, cucumbers. Tons of them. So I pick a few out, and I decided to ferment them. Then I go to the Farmer’s Market and find more, so I ferment some more. Between the several gallons of ACV I have brewing and the pickles, my little apartment might burst! My plan is to have enough to last through the winter, or at least have enough to fill the space in my fridge. All the pickles you buy in the store are made with vinegar. They are tasty. And tangy. 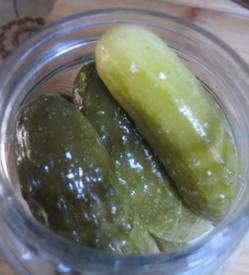 But they don’t have the probiotic benefits of real, fermented pickles (read about fermented foods here). And they most likely use GMO containing white vinegar (white vinegar is made from corn). You’re likely to pay a premium price for real pickles (A regular sized jar runs around $8-$9 here). Why not experiment and make your own? I’ve got the recipe! Wash the cucumbers. Stack in the glass jar and fit as many as you can in the jar. The more you get in there, the better. Fill the Jar with enough water to cover the pickles completely, with a little extra space above. According to how much water you used ( I used 8 cups, so I would need 4 Tablespoons salt), dissolve the salt in a little warm water and add to the jar. Fill a ziplock bag with water and seal. Weigh down the contents of the jar to make sure everything is under water. Place in a slightly warm, dark area (like above the fridge!) and ferment for a minimum of 5 days. I did 8 days and they turned out great! Place in the fridge and they should keep for at least 6 months!